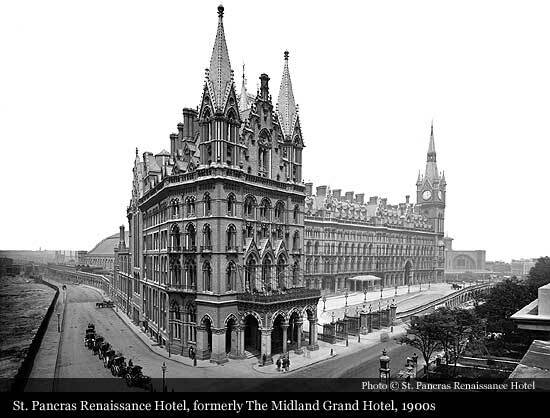 In 1865, Midland Railway ran a competition for the design of a 150-bed hotel with the brief that it needed to add lustre to its, at the time still under construction St Pancras station. Eleven architectural designs were submitted, including one by the George Gilbert Scott, architect of choice of one of the Directors of the Midland Railway. 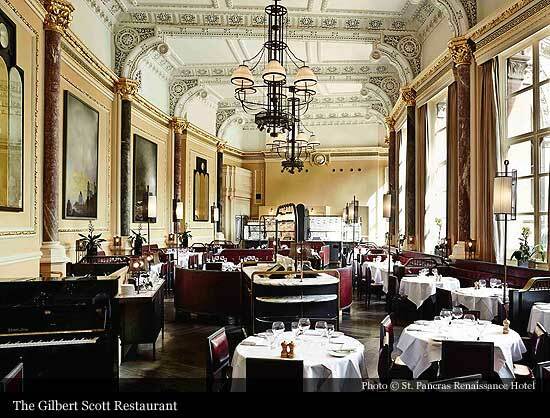 Even though Scott submitted a plan far bigger, grander and far more expensive than the original specification, his audacity paid off and he was awarded the contract in 1866. Principally due to the international financial downturn of the same year, commonly known as the Panic of 1866, he was instantly required to subtract a floor as well as having to adhere to a number of other cost cutting measures. Construction of the Midland Grand Hotel - as it was originally named, took place between 1868 and 1876 and was completed in various stages with the East Wing opening on 5th May 1873 and the rest followed in Spring 1876. The architecture of the building is most commonly categorised as Gothic Revival, the predominant architectural style at the time. When opened, Midland Grand Hotel set many innovative features in the hospitality industry: two hydraulic lifts, unique calling system of electric bells, 22 inch thick concrete floors with an innovative fireproof floor construction, flushing toilets - feature which was almost unheard of for a hotel at this time. In 1899 a specially designed revolving door was fitted in the hall entrance which was supplied by the inventor of the revolving door, Theophilus Van Kannel. 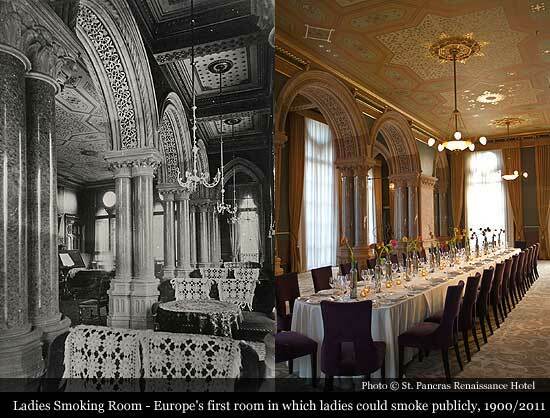 The Midland Grand's Ladies’ Smoking Room (actually the gentlemen’s and ladies’ smoking room) was the first room in Europe in which ladies could smoke publicly. 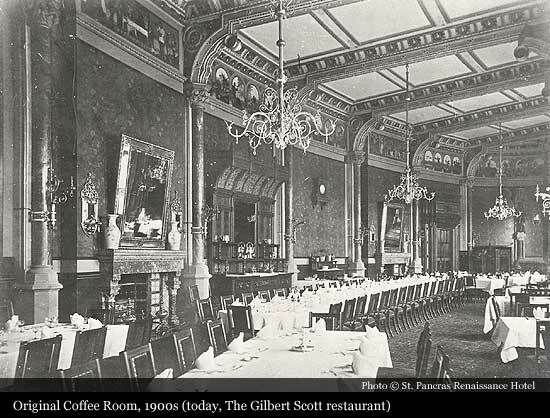 The status schematics of the hotel were contrary to the hotels of today; the Midland’s grandest rooms were on the lower three floors with the upper floors providing more basic rooms and staff accommodation. 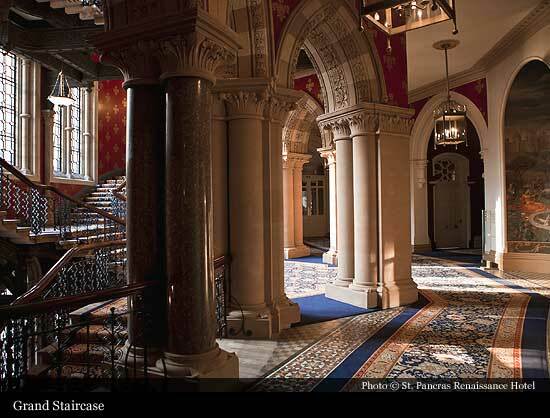 The Grand Staircase, a fantastic example of high-Victorian, gothic decoration was hotels' most famous feature. Both the width of this staircase as well as the corridors is also markedly wide by today’s standards the reason being that it allowed two ladies in bustles to pass. Altogether, the total costs of the building added up to £438,000 (approx. £438m today). Although the results were spectacular this was an extortionate amount and even Scott commented that “it is almost too good for its purpose”. 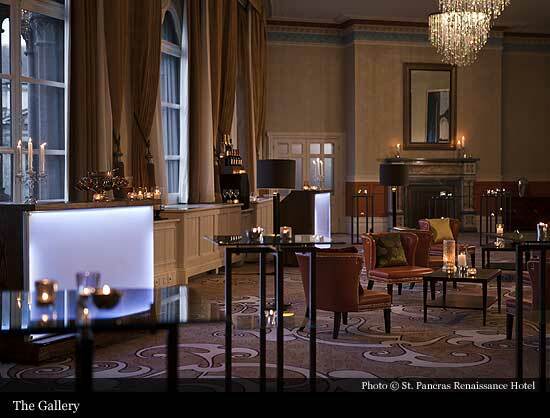 The Midland Grand’s reputation was quickly cemented and it was widely recognised as one of London’s leading hotels. Apart from The Langham on Portland Place, it was the most expensive hotel in London. Rooms were charged between 3s6d and several pounds a night. Guests of note during the hotel’s heyday included Johnnie Walker, Jesse Boot, the actress Marie Lloyd, the American inventor and industrialist, George Pullman and Commodore Vanderbilt, one of American’s richest men who stayed at the hotel in the early 1900s and fell so in love with the station that he brought the concept back to New York and used it as a blueprint for the design of the original Grand Central Station. The hotel continued to make a profit until post WWI but it then became too expensive to maintain and heat, as well as, its utilities became outdated. Despite novelties such as a Moroccan coffee house and an in-house orchestra the hotel couldn’t be saved from these problems. In 1922 the Midland Railway was forced into grouping with other railway companies and so the hotel became the property of London, Midland and Scottish Railway (LMSR) before its eventual closure in 1935. Its facilities couldn’t vie with its competitors and the expense in running it had become too great. 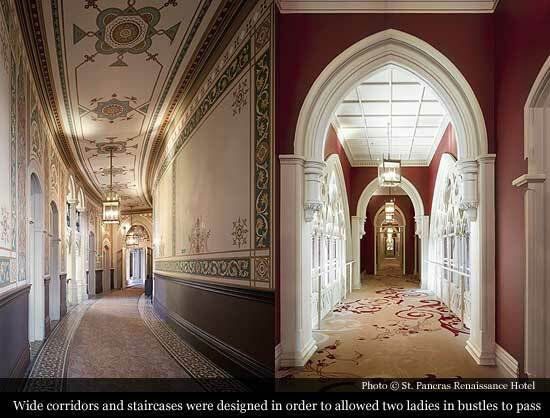 Following the hotel’s closure to the public it then came to accommodate British Rail staff. In 1948 it became the HQ for British Transport Hotels and remained so until Thatcher’s government privatized the non-core businesses of British Rail, which included the BTH. British Rail continued to use it itself until a failed fire certificate forced them out in 1985. During its time as British Rail offices a lot of the original stenciling and paintwork was painted over and tiles and stone columns boarded up. 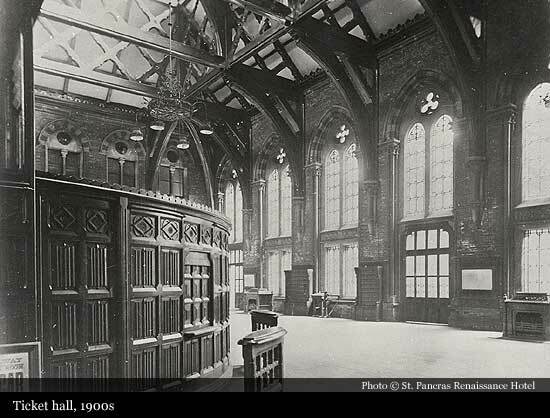 It was also during this period that huge attempts were made to demolish it: its close proximity to Kings Cross and Euston Stations made it almost redundant and there was also a strong movement against this type of overtly Gothic architecture at the time. Fortunately and despite his worry that it was “too beautiful and too romantic to survive”, a quest led by Sir John Betjeman resulted in it being granted Grade I listed status in 1967 which ensured its preservation for the future. Following this it then became a popular choice for film and TV locations (Gulliver’s Travels, Batman Begins, Shirley Valentine, The Secret Garden, Bridget Jones’ Diary, From Hell, The Golden Bowl, Nicholas Nickleby and The Lost Prince amongst many others), photoshoots (including Brides and GQ) and video shoots (most famously as the backdrop to the Spice Girls’ video for their inaugural hit ‘Wannabe’). 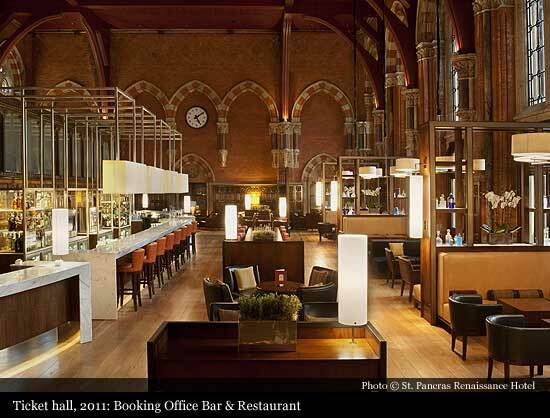 In 1996, following the announcement of the new, international station at St Pancras, London & Continental Railways (the building’s leaseholder) put out a competition in order to select a development team to restore and re-open the building. A consortium of BAA Lynton (British Airport Authority’s commercial property division), Manhattan Loft Corporation (MLC) and Whitbread (franchisee of Marriott Hotels in the UK) won the restoration and refurbishment project in 2002, the winning proposal combining a high quality hotel with loft apartments above. Originally MLC was only responsible for the development of the apartments but following BAA’s sale of its commercial property arm and Whitbread selling its franchise of Marriott Hotels in the UK, Harry Handelsman, CEO of MLC, made the bold decision to undertake the redevelopment of the whole building. 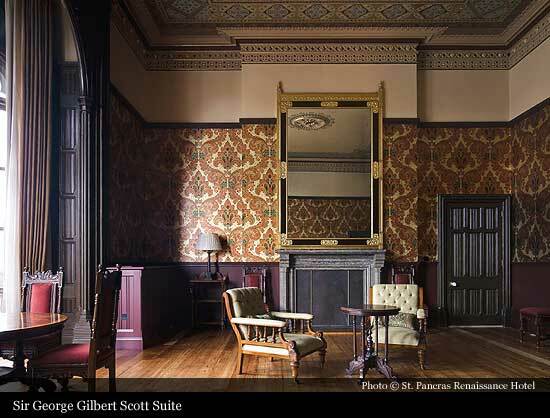 Although costly, and at times interminable, with the new hotel now open there is no doubt that this has been one of the most significant restoration and redevelopment projects witnessed by an English Heritage listed property in recent decades. Hundreds of expert craftsmen and painters were employed on site to undertake this work and at one time or another every leading conservation expert in the South-East was engaged in the project. 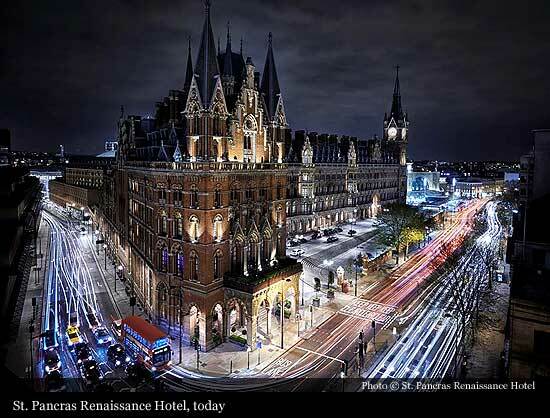 The St Pancras Renaissance Hotel formally opened on 5th May 2011, exactly 138 years after the Midland Grand Hotel originally opened. It is the final piece of the St Pancras regeneration project, which includes a £800 million restoration of the Station. 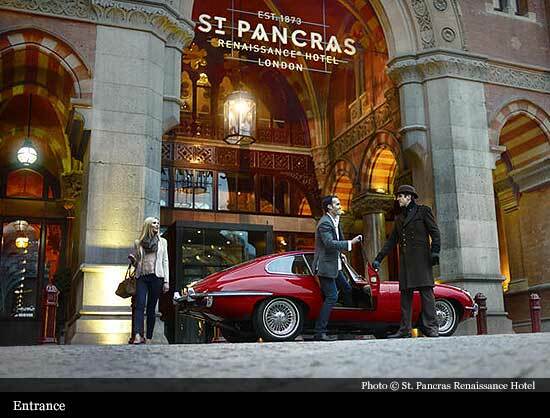 The station was re-opened as St Pancras International, by Her Majesty the Queen in November 2007. The sixty-six apartments situated on the upper floors of the building were completed in 2010.